A chord progression can be described as a series of chord changes that are played throughout a piece of music. When you listen to music of different genres you will notice that there are several changes that occur. These changes normally flow with the melody of the piece. The changes that you hear taking place in music are musical progressions. Whether you play the guitar, organ or piano in a band you will have to make some form of relative movements that falls within the structure of the song. Important Notice - Before you approach the concept of chord progression, it is very important that you learn to play all the basic chords on your piano or keyboard. Some of the basic chords you need to know are major, minor, augmented and diminished. All other chords will fall into place as you learn more about the piano. 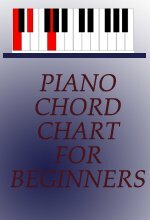 Click here for more information on piano chords! Progressions are built based on the position of notes in a scale. Each note within a major scale is used to form a specific chord. The notes in a scale are represented by numbers called intervals. 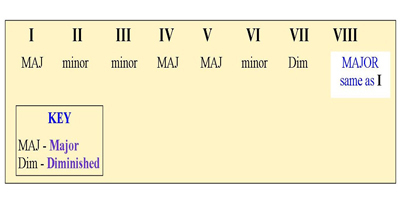 Roman numerals are traditionally used in music to represent note positions, but contemporary musicians have used the universal numeral system. 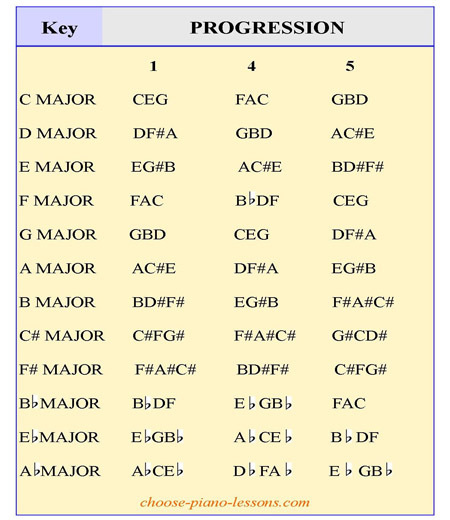 Each position of a note within a major scale is used to form a chord. Below is an illustration that will explain more. In the illustration above the 1st or tonic note forms the tonic or main chord which is a major. You should notice that the 1st, 4th and 5th notes of the scale are all major chords while the 2nd, 3rd and 6th notes are minor chords. The 7th note forms a diminished chord which will be discussed in another lesson. This method applies to all major scales. Chord progressions are normally represented by numbers. For example – 1,4,5 or I-IV-V. This type of progression is called the one-four-five progression. If this type of movement is done in the C major scale then you would play C major chord, F major chord and G major chord. There are different types of chord progression in music. Here is a list of some popular progressions that are played on the piano, organ or synthesizer. Take a look at how these progressions are apply in the key of C major. There are some songs that use the 1-4-5 or 1-5-4 progressions throughout the entire music. However, most popular musical styles such as rhythm and blues, funk, rock, gospel and jazz use two or more different progressions. It is very important that you know how to play all the progressions listed above in every key, so you will need to practice. However, it is very important that you take them one step at a time. 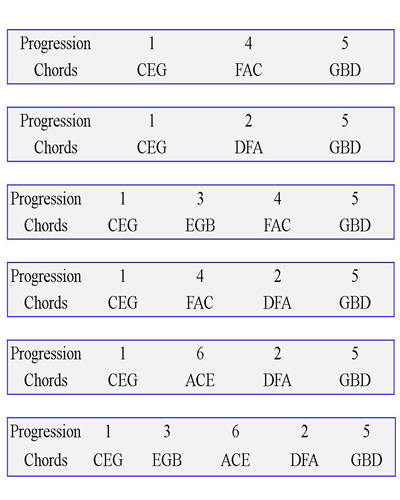 Below is a table showing all the chords for the 1-4-5 progression in all 12 keys on the piano. 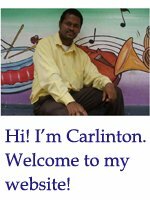 Click here to move on to more piano progression lesson! Click here to leave the chord progression page and return to the home page.